Introduction. Pathological dislocation of the hip is one of the most severe complications of acute hematogenous osteomyelitis. The program of treatment for children with pathological hip dislocation is complex, but it has been sufficiently developed and implemented very successfully. At the same time, the available literature provides no cases of treating children with bilateral pathological hip dislocations after hematogenous osteomyelitis. There is no information on the incidence of such cases or in regards to remote functional results. Materials and methods. 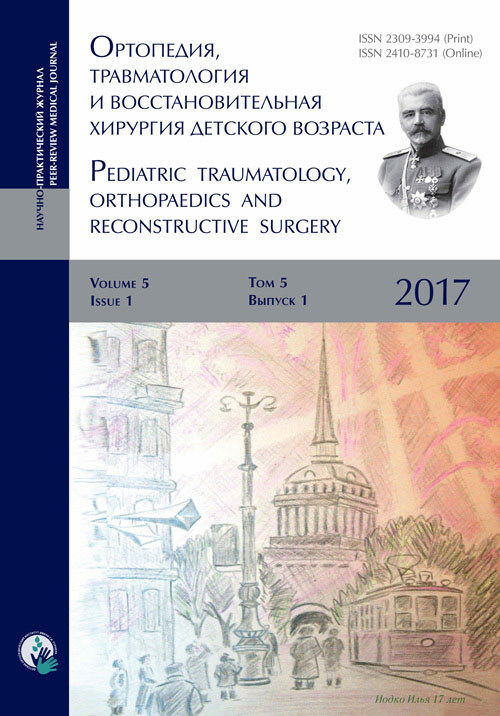 The results of the treatment of 18 children with bilateral pathological dislocation of the hip after hematogenous osteomyelitis are presented, which constituted 23.1% of the total number of patients (78) who underwent surgery in 2000–2016 for the diagnosis of pathological hip dislocation. Both hip joints were surgically operated on in 12 patients, while one hip joint was operated on in 6 patients. To assess the anatomical and functional state of hip joints, the clinical and roentgenological diagnostic techniques were used. Results and discussion. To stabilize and restore the function of the hip joints, 18 children underwent 30 surgical interventions: simple open hip reduction (19) and open hip reduction with hip arthroplasty with one (6) or two (5) demineralized osteochondral allogeneic grafts. The decision regarding the possibility of performing surgical intervention on the second hip joint was made only after a child's check-up examination was complete and after positive information about the anatomical and functional state of the operated hip joint was obtained. According to these criteria, 14 (77.8%) children underwent surgical treatment of the second hip joint 1–1.5 years after the course of conservative measures to restore the range of motion in the previously operated hip joint. Over a period of 1–12 years, 17 patients were examined, 10 of which underwent an operation on both sides (27 joints). The preservation of up to 80º or more of motion amplitude was noted in 17 (62.9%) of 27 operated hip joints. When assisting patients with pathological hip dislocation, it is necessary to understand that it is practically impossible to restore the affected joint to the anatomical state of the opposite unaffected joint. As for the bilateral lesion, this is most certainly impossible, and the development of arthrosis is inevitable. Therefore, the most important factor reflecting the degree of well-being and stability of the affected joint is the amplitude of active movements. Preserving this amplitude in the affected joints with a careful and attentive attitude is a fundamental and feasible task. children, consequences of hematogenous osteomyelitis, bilateral pathological hip dislocations. Pathologic dislocation of the hip is one of the most severe complications of acute hematogenous osteomyelitis. It has occurred in children of early age and manifests not only as a disorder of anatomic arrangements in the affected hip joint but also as destructive changes in the femoral head and neck of various degrees. The disorder of cotyloid-cavity growth and scar changes in the soft tissues surrounding the joint contribute to the formation of joint contractures and the development of secondary static deformities. Treatment of children with pathologic dislocation of the hip is difficult, but it has been sufficiently developed and can be implemented very successfully [1-7]. At the same time, to our knowledge there have been no reports of treating children with bilateral pathologic dislocations of the hips after hematogenous osteomyelitis. There is no information on their frequency and long-term functional results. Only single publications have addressed the issues of diagnosis and treatment of bilateral hip dislocations in children with a history of inflammatory processes [8, 9]. In the literature on pathologic dislocation of the hip, data have indicated that two-sided localization is fairly rare . From 2000 to 2016, we supervised 18 patients (11 boys and 7 girls aged 1.5–9 years) with bilateral pathologic dislocations of the hips caused by acute hematogenous osteomyelitis during the neonatal period. These patients constituted 23.1% of the total number of patients (78) who underwent surgery in the department of bone pathology of the Turner Scientific and Research Institute for Children’s Orthopedics, the Ministry of Health of Russia, during the specified period with a diagnosis of pathologic dislocation of the hip. Clinical and roentgenologic studies were performed to assess the anatomic and functional state of the hip joints. Standard (prone) and functional (upright) radiographs of the hip joints were performed to assess the degree of stability. All patients were examined after voluntary consent from their parents or official representatives was obtained. According to the x-ray data, most patients had no full femoral head and neck, and their proximal ends were represented by greater trochanters or the latter in combination with the remnants of the heads and necks (23 joints, 63.9%; Fig. 1). In addition to the hip joints, 10 (45.5%) children suffered from lesions of other joints, including the knee (4), humerus (2), and the maxillomandibular joints (4). Of the 18 children, 12 (9 boys and 3 girls) underwent surgery of both hip joints, whereas one hip joint was operated in 6 patients. Unilateral surgical intervention was performed once in four children, while two required additional surgeries to stabilize (1) or restore the function (1) of the joint. Fig. 1. Radiographs of hip joints in patients G., 5 years old (a), and I., 1.5 years old (b), with bilateral pathologic dislocations of the hips. The surgical intervention was performed in 14 (77.8%) children between the ages of 1.5 and 4 years and in 4 (22.2%) at the age of 5 years or older. The decision on the possibility of performing surgery on the second hip joint was made only after follow-up examination of a child was performed and positive information was obtained about the anatomic and functional state of the operated hip joint. Therefore, 14 (77.8%) children underwent surgical treatment of the second hip joint 1–1.5 years after the course of conservative measures aimed at restoring the amplitude of movements in the previously operated hip joint. A positive surgical result was determined when there was absence of dislocation at a sufficient degree of osseous covering of the proximal end of the thigh bone by the acetabular roof and when the flexion amplitude in the operated hip joint exceeded 60º (Fig. 2). To stabilize and restore the function of the hip joints, 18 children underwent 30 surgeries: simple open hip reduction (19) and also hip reduction with hip joint arthroplasty with one (6) or two (5) demineralized osteochondral allografts (DOCA). These procedures were done for single-step (15) or sequential (3) formation of the acetabular roof (7), modeling resection of the proximal end of the thigh bone (8), or corrective, including shortening, osteotomy of the thigh bone (5). One patient who had pronounced changes in one of the affected hip joints underwent the maximum amount of surgical interventions for stabilization, including open hip reduction, hip joint arthroplasty with two DOCAs combined with detorsion and shortening osteotomy of the thigh bone, and a Salter procedure. Surgery was performed with the patient lying on a healthy side. After the arcuate Watson-Jones incision was made and dissection of the superficial and fascia lata of the thigh was performed, the great trochanter was cut off, together with the ventral gluteal muscle and gluteus minimus muscle attached to it. The scar cords in these muscles were intersected with a pointed scalpel-tenotome without transsection of the muscle fibers. The proximal end of the thigh bone and the cotyloid cavity were isolated and released from the scar tissue, and the lumboiliac muscle was transsected. The proximal end of the thigh bone was assessed visually, and if the head of the femoral bone was preserved, its articular cartilage as well as the cartilage of the cotyloid cavity were assessed. In the absence of destructive changes in the cartilage of the femoral head and the cotyloid cavity, the proximal end of the thigh bone was immersed in the cotyloid cavity at the abduction position (30°–40°) and the internal rotation of the thigh (10°–15°), and the greater trochanter was fixed to the outer surface of the thigh bone with a screw or pins 1–1.5 cm below its previous position. The postoperative wound was closed layer-by-layer with drainage tubes placed. Tenotomy was performed for the tension of the adductor muscles of the thigh. At weeks 3–4, a sesquialteral coxofemoral plaster cast-spacer was applied. In the absence of the femoral head or destruction of the hyaline cartilage of the femoral head, the surface of the proximal end of the thigh bone was formed with the help of ball-shaped mills. In the case of destruction of the hyaline cartilage of the cotyloid cavity, its spherical surface also was formed with the milling cutter. In younger children, sparing treatment of the cotyloid cavity should be performed to avoid its bottom’s protrusion. After treatment of the thigh bone and the cotyloid cavity, on the shaped surfaces, for the various indications, one or two whole or perforated DOCAs were fixed along the periphery with separate or twisted sutures. The proximal end of the thigh bone was immersed in the cotyloid cavity in the above position, and the incised great trochanter was fixed to the outer surface of the thigh bone with a screw or pins 1–1.5 cm below its previous position. The postoperative wound was closed, and at weeks 3–4, a sesquialteral coxofemoral plaster cast-spacer was applied. An important component of the success of surgical intervention is decompression of the hip joint, which is provided by free insertion of the proximal end of the thigh bone into the prepared cotyloid cavity. Therefore, in children with a preserved femoral head and neck, before their insertion into the cotyloid cavity, according to the indications, a shortening osteotomy of the thigh bone was performed from a separate access in the lower or middle third, which, with the great trochanter incised, preserves the viability of the femoral head and neck. It should be noted that with the relative stability of the hip joint and the retention of the proximal end of the thigh bone within the cotyloid cavity, surgery may be limited to the aforementioned aids. Additional (if necessary) stabilizing extra-articular intervention in the form of transposition of the cotyloid cavity or acetabuloplasty (pelvic osteotomy) can be performed at the second stage after restoring the amplitude of movements in the operated hip joint. In case of pronounced hip joint instability due to slanting of the arch and flattening of the bottom of the cotyloid cavity, the extent of surgery can be increased. In this case, open thigh reduction or arthroplasty of the hip joint with DOCA can be supplemented by transposition of the cotyloid cavity (pelvic osteotomy), and the period of immobilization with a plaster cast is increased to 5–6 weeks. The restorative measures were begun at the moment the plaster cast was transferred to the plaster “bed” and on X-ray examination of the condition of the operated hip joint. The plaster “bed” 3 weeks after removal of the plaster cast in older children was left only for the night. In younger patients, it is advisable to leave the plaster “bed” for a longer period. During the day, a child would receive exercise therapy (ET) with the help of an instructor or with parents, who had been trained for the elementary skills of the ET. Depending on the age of the child, ET was performed up to three times a day with 40 min between physical therapy sessions. Cuff stretching was prescribed for the child for the thigh or lower leg with loads of 1.5–3 kg, which can be performed directly in the ward. Cuff stretching was not prescribed for children younger than 5 years since, with sufficient decompression of the hip joint, the restoration of movements was achieved with the help of physical therapy exercises. To prevent formation of rotary contractures, the limb was fixed in the middle position using a removable derotation plaster “boot” with its obligatory retraction in the hip joint. To restore movements in the operated hip joint, the child was allowed to sit down in bed for short periods of time. Four weeks after the removal of the plaster cast, the plaster “bed” was discontinued in the older children. At the same time, the child was advised to continue to observe the regimen of periodic cuff stretching. At this time, active movements were prescribed in the joints of the operated limb with gradually increasing amplitude. At 3–4 months after surgery, the child was allowed to ride a bicycle and walk with crutches without leaning on the operative lower limb. The list of physical therapy exercises to prevent flexion contracture included a setup for hip extension, the performance of which was obligatory after each ET exercise. At 5–6 postoperative months, the child was allowed graduated weightbearing on the forefoot. The load on the limb was increased gradually by month 8 after the end of the postoperative period, and full weightbearing was allowed 10–12 postoperative months after evaluation of the radiographs of the hip joints. It should be noted that all children were discharged from the hospital after a control X-ray examination and a course of conservative therapy, including massage, physiotherapy, and ET, with an amplitude of flexion in the operated hip joint of at least 80°–90º, if they had retained this amplitude at follow-up after 3 to 4 months. This time interval seemed to be sufficient for assessing the functional state of the operated joint and was used for hospitalization of a child in an inpatient department for removal of metal structures. During the long-term follow-up (1–12 years), 17 children were examined (six were examined at 1–1.5, seven at 2–3, three at 4–7, and one at 12 years). In 10 children, both hip joints were operated (Fig. 3). All patients suffered from lameness, which is caused not only by the dislocation of the thigh bones but also by the shortening and weakness of the gluteal muscles. Pain syndrome was not noted in any observation. The marked lordosis of the lumbar spine due to the presence of moderately pronounced adduction-flexion contractures of the hip joints was seen in five patients. In this context, the amplitude of movements in 17 (62.9%) of the 27 operated hip joints exceeded 80° to 90º, and in 9 (33.3%) joints it reached 100º or more (Table 1). These amplitudes of movements in the operated hip joints, depending on the type of surgical intervention performed, among which open hip reduction predominated (66.7%), are of interest. At the same time, the results of the examination indicated preservation of the amplitude of movements in the joints, exceeding 80°–90º and even 100º or more in the long-term follow-up period in the majority (62.9%) of the patients. Attention should be paid again to the functional results of treatment of children who underwent arthroplasty with the use of a DOCA for the purpose of stabilizing the hip joint. In our study, as in a study conducted previously , the frequency of positive long-term results is very high. As for ankylosis and expressed extension contractures, their number is insignificant and did not exceed 15% (Table 2). Note: OR - open hip reduction; MR - modeling resection, including subchondral modeling of the femoral head; CO - corrective shortening osteotomy of the thigh bone; and A - arthroplasty of the hip joint. The attitude toward treatment of bilateral hip dislocations remains ambiguous, and “it is much more difficult to decide the reasonability of the surgery” , especially since the long-term functional results of treatment are far from perfect [11, 12]. Therefore, considering the results of treatment of children with bilateral congenital dislocations of the hips, many investigators reasonably note that it is advisable to operate on the second hip joint only when surgical intervention on the first joint was successful and function was restored [11, 13]. We fully share this position. To solve the problem of helping patients with pathologic hip dislocation, it is necessary to realize that remodeling of the joint by “bringing it” to the anatomic state of the opposite unaffected joint is practically impossible. In the case of bilateral lesions this is especially impossible and the development of arthrosis is inevitable. Therefore, the most important component, reflecting the degree of well-being of the affected joint along with stability, is the amplitude of active movements. Preserving this amplitude, while keeping a careful and attentive attitude towards the affected joints, is a fundamental and solvable task and it is quite realistic. This work was performed on the basis and with the support of the Turner Scientific and Research Institute for Children’s Orthopedics, the Ministry of Health of Russia. The authors declare the absence of obvious and potential conflicts of interest related to the publication of this article. Tahasildar N, Sudesh P, Tripathy SK, Shashidhar BK. Bilateral pathological dislocation of the hip secondary to tuberculous arthritis following disseminated tuberculosis: a case report and review of the literature. J Pediatr Orthop B. 2012;21(6):567-73. doi: 10.1097/BPB.0b013e328354da73. Malossini L, Vercellesi E. On a case of bilateral pathological dislocation of the hip. Minerva Ortop. 1971;22(11):431-4 (In Italian). Copyright (c) 2017 Garkavenko Y.E.